It is recommended that smoke detectors be installed within 15 feet of all bedrooms, one on each floor level of ou r homes, and if at all possible one should be placed in each sleeping area. 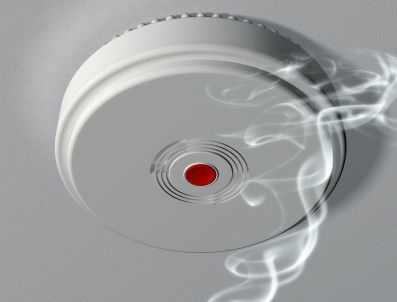 Further smoke detectors in new homes must be wired into the household electrical current in such a manner that if one detector activates, they all do. In older homes we still see the battery operated detectors, which have done a great job for many years, provided the batteries are replaced on a regular basis. “Change your clocks, change your batteries”, this way the batteries are being replaced twice a year in your smoke or carbon monoxide detector. Carbon monoxide (CO) is a colorless odorless gas produced by appliances burning fossil fuels such as furnaces, wood burning fireplaces/ stoves, and in some cases even candles. 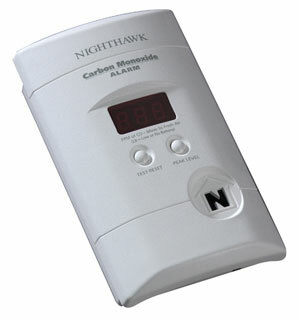 Carbon monoxide is referred to as the silent killer accounting for 200-300 unintentional deaths per year. The dangers of CO exposure depend on a number of variables, including one’s general health and activity level. Infants, pregnant women, and those affected by heart or lung disease can be severely affected by lower concentrations. A person can be poisoned by a small amount of CO over a long period of time or by a large amount of CO over a shorter period of time. When purchasing a smoke or CO detector look for proof that the detector has been tested by a national testing laboratory such as Underwriters Labs (UL), or Factory Mutual (FM). Always follow the manufacturer’s directions when installing them. Many of the detectors powered by the household electric current have a battery back-up, in the event there is a power failure. • If it is an intermittent alarm and the detector is battery powered or has a battery back-up check the battery. Detectors are designed to activate in this manner when the battery power is getting low. • If it is a steady alarm make sure everyone in the home is alert. • If the source of the activation cannot be immediately identified evacuate and request the Fire Department by dialing 9-1-1. • Never re-enter the house until the Fire Department has given the OK.